A beautiful landscape wallpaper pictures of a sunrise and moving clouds taken at Palm Beach, NSW, Australia as the sun rises and beautiful hues light the morning sky over the sandy Pacific coastline while Barrenjoey Lighthouse shines on top of the Barrenjoey Headland. Deep blue sky has been taken over by cloud formations. As another day awaits the arrival of the Sun, the stunning sunrise filters through the clouds and shines off the water. This image belongs to the travel and nature stock photo library. This stock photo of Barrenjoey and Palm Beach at Sunrise is available for licensing for commercial and editorial uses including websites, blogs, books, magazines, brochures and advertising. Restrictions may apply for images which contain third party copyrighted material or sensitive subjects. Photos of artwork are for editorial use only. 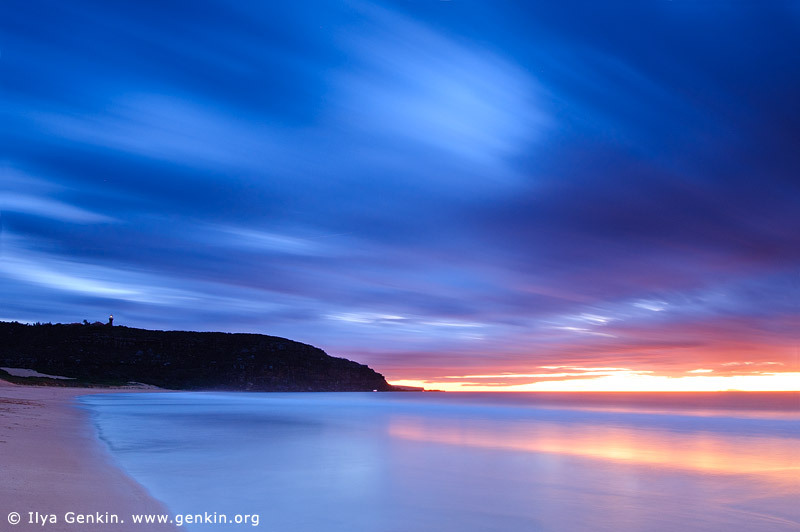 This image id PALM-BEACH-BARRENJOEY-0001 of Barrenjoey and Palm Beach at Sunrise, is copyrighted © by Ilya Genkin. This is not a public domain image.